Felted one-of-a-kind art is what Feltunik is all about. The artist behind Feltunik is Nina Vance, a textile artist currently living by Lake Erie in PA, USA. While growing up in northern Norway, Nina discovered an early appreciation for the unique qualities of wool. In her younger years, her grandmothers patiently taught her how to knit and sew. Nina spent countless hours knitting through miles of yarns and sewing full speed on the sewing machine. She felt motivated to complete her pieces, but wasn't necessarily enjoying the process. That all changed after being introduced to Nuno Felting. 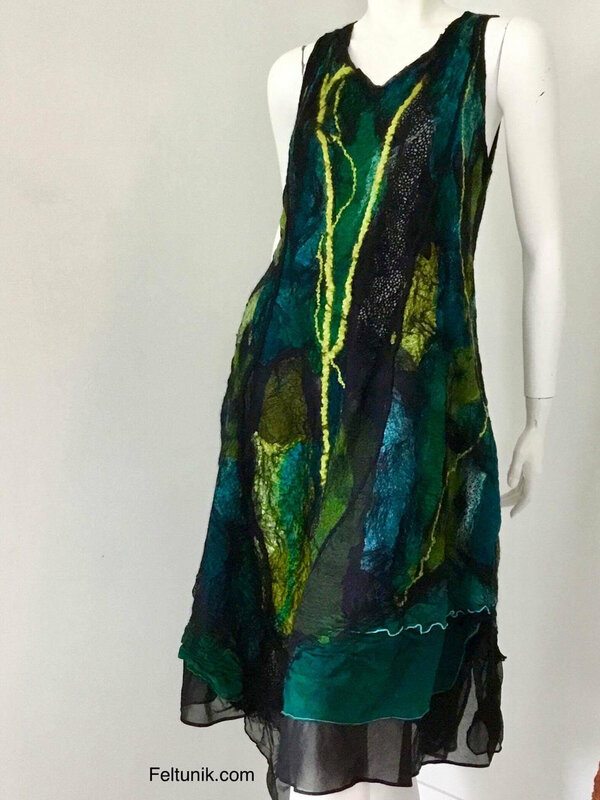 I first caught a glimpse of Nina's stunning art-to-wear at a Textile Art Alliance show in 2016 and immediately fell in love with the bold designs and quality construction of her pieces. I carry her wearable art today at Fra Angelica Studio and recently caught up with her to share a little bit more about what's behind this amazing work. 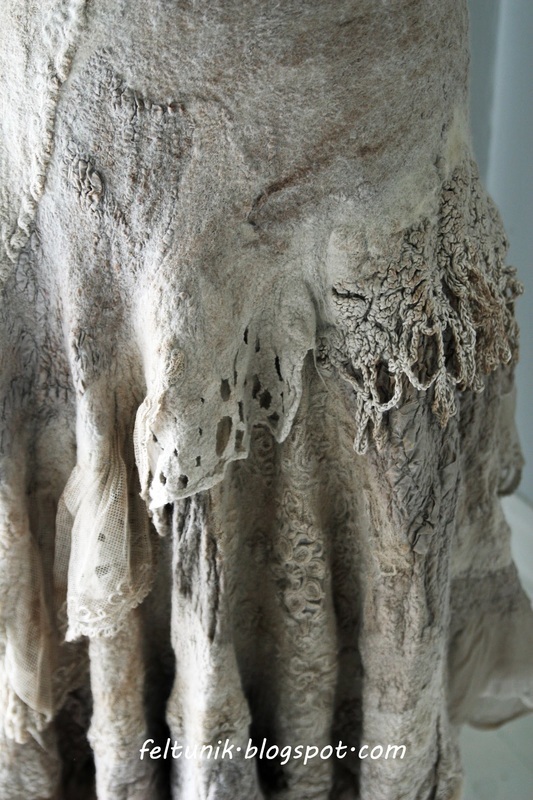 "Since great textures can be achieved with nuno felt, I often find inspiration in nature. A beautiful rock, waves, the many shades of blue as reflected in the sea, moss on a rock, a coat I saw someone wear in Venize... Having a busy, creative mind, I do find inspiration anywhere. While studying biology and human anatomy, I discovered an endless source of inspiration which I keep coming back to. Nuno felt offers so many options to work flat or sculptural, and the opportunities seems nearly endless." "Merino wool is the binding agent in my work. I love that I can work the fibers to create seamless products, shapes, and textures. To me, It is a magical material that I never grow tired of working with. In the process, merino wool fibers travel through somewhat open weave materials. I have used old heirloom lace, new and recycled silk, and other fine, natural fabrics. Often the fabrics are hand dyed and sometimes printed. I also incorporate accents such as yarns, beads or laminated pieces of dense materials that do not felt." "The process starts with a pattern enlarged to accommodate for shrinkage. I begin by laying out my merino wool fibers using different directions and layouts to create desired effects. I then follow with fabrics, maybe lace and yarn and create a surface. After adding soap and hot water, the project is rolled to start the blending and shrinking. An initially gentle rolling transitions to a more hands-on approach, spot shrinking, and shaping. After this stage, the project is finally rinsed and ph neutralized. It is the most amazing process, and the results are not 100% predictable. However, with experience you gain more and more defined control." 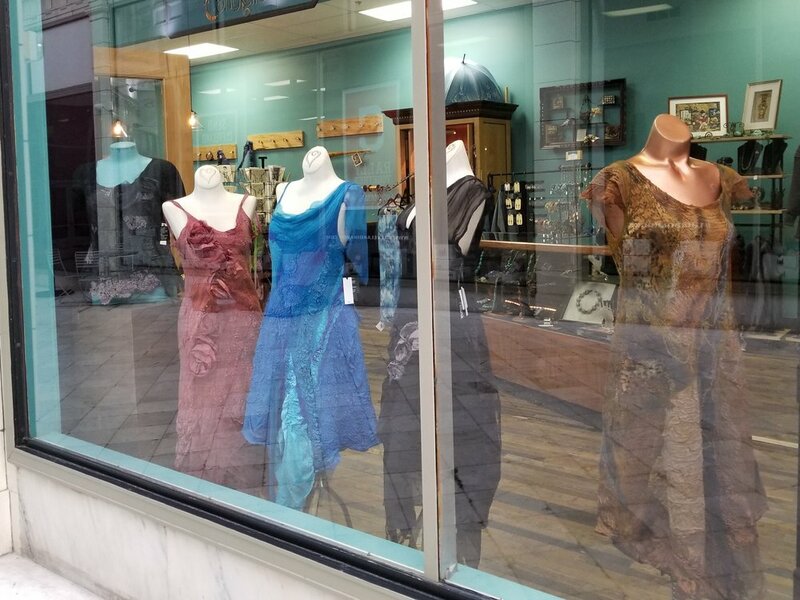 Are you looking for a one-of-a-kind Cleveland shopping experience? Fra Angelica Studio proudly carries a unique collection of Feltunik art-to-wear. If you're looking for a unique gift idea for someone special or bold and beautiful designs for yourself, stop on by to try some on, or have a look.